Open the source SDK and Create anew mod. This path can be what you want ( ex : c:/mymod/ ). Note : This directory must not have a gameinfo.txt at his root. 2. the second string field to fill is the Name of your Mod project, as a directory in steamapps/sourceMods/ will be created with the name you choose. note : prevent to add space and exotic characters. 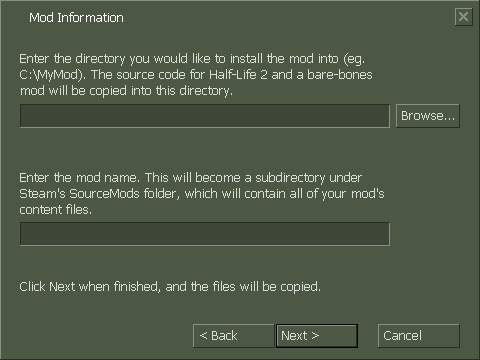 This is the directory of the final mod, the one you will launch from steam to run your Mod. 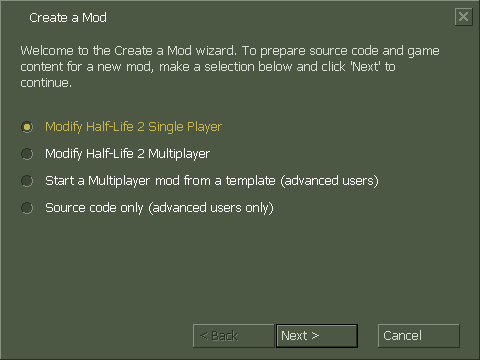 Additional informations : Create a mod on Valve Developer Community.